This online course is for health professionals, nurses, physicians, therapists, beauticians and other health conscious people who are interested in working with facial reflex therapy to improve people´s aspect and wellbeing. If you love helping people who want to look more beautiful and feel great then this course is for you! 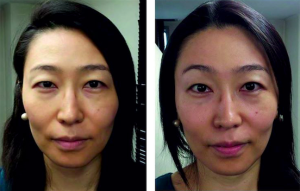 Japanese self–lifting is a method composed of techniques from Facial Reflex therapy sorensensistem TM and Japanese facelifting techniques tested and composed of Lone Sorensen in the most efficient manner and with 36 years of experience in facial therapy. 10 years working Japanese the background for this special creation that promises performance without surgery. It utilizes combination of points on the face related to the meridians from Oriental medicine, reflex points from the Vietnamese method and other types of points to stimulate and treat skin quality. Techniques that also directly impact the muscles, tissues. Furthermore it is a fantastic muscle technique special for the eyes, – opening the eyes by increasing blood circulation and preventive to keep the eyes and sight in best health conditions. 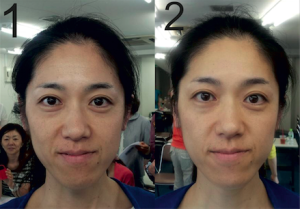 I am so grateful for learning facial reflexology + japanese Cosmo Face lifting- it has really changed my practice and I have only been practising reflexology since 2013. To be offer clients an alternative to foot reflexology or a mixed treatment is such a unique experience. to that space of DEEP RELAXATION. –Tracey H.
In module 2 of Japanese Cosmo lifting students will learn techniques comprised of several different methods. You will learn to combine points on the face related to the meridians from Oriental medicine, reflex points from the Vietnamese method and others. These will be aimed to stimulate and treat skin conditions such as dry, oily, combination skin issues, as well as skin problems such as a lack of muscle tone, collagen deficiency, sagging skin, spots, rosacea, sun damage etc. We will also cover techniques that directly impact on the muscles, tissues, organs and other structures of the body. Additionally, we’ll be learning about a fantastic muscle technique especially for the eyes – it opens the eyes by increasing blood circulation and acts as a support for the maintenance of improved eye health and eyesight. As it is offered as a digital product you will be able to download and watch the tutorials on your computer as often as you wish. You will also have FREE access to ONE of Lone´s monthly Live ASK Lone webinars where Lone will answer all of you questions that come up during this course. If you have further questions regarding this or any other of our courses please don´t hesitate to email us at infom@institutlonesorensen.com for more information. Enjoy this course! Money Back Guarantee: You have 30 days to request a refund and we will pay you money back, no questions ask!